There are many Alternative deck materials out there which can make it very difficult to make a choice. CFD has been installing MOISTURESHIELD composite decking for many years because they have proven themselves to be a solid, long-lasting decking. Beautiful, natural wood grain texture on both sides, many color choices, grooved or not grooved for easy installation. It can be installed on or in the ground or underwater without voiding the warranty. No other decking can say that. Cedar, Ipe, Mahogany, and Siberian Larch are some of the wood decking that is also available. 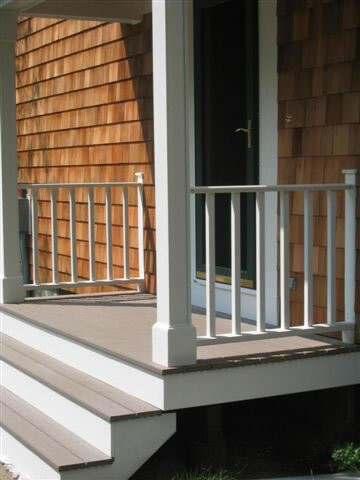 Railings provide the finishing touches for your new or existing deck, porch, or stairs. Safety is the practical consideration behind the installation of railings. However, in selecting railings, keep maintenance in mind. There is also an aesthetic component: choosing wisely from among the various deck railing styles is critical to the project from both a design and safety perspective. Our vinyl railings meet rigorous national building codes. ILLUSIONS brand railings use top-grade materials from the nation's leading extruders of vinyl products. Our fabrication shop will customize your maintenance-free vinyl railing with our C.N.C router to ensure all the balusters are evenly spaced for your particular post spacing. Your railings will look perfect every time! KEYLINK Railings, with so many balusters, colors, trim, and accessories to choose from, makes the final product really a one-of-a-kind. Keylink aluminum railings gives customers the ability to match their railing to their surroundings and taste, without having to choose between the railing they want and the railing they can afford. At Crowe Fence & Deck Supply, we have numerous styles and materials to ensure a good match with the look of your home. Whether it's Vinyl, A.D.A. railing, Iron, or Aluminum, we have the railing system for you.